I have long been a loyal customer, choosing your airline even when flights are a bit more because it is just less stressful to be around cheerful flight attendants, not worry about my bags costing money, and to not constantly feel like I am being "upsold" along my journey. Less stressful that is until last November. On a trip to lay my grandmother to rest that month, the TSA screeners gave me such a vigorous pat down of my genital area with the fronts of their hands, and with such a negative attitude, that I made a decision: If I can drive I will. You see, while the federal government does control the TSA, so do the airlines. Now, I know it is much easier for a business to blame a federal law for why you need us to stay in our seats and off our computers on takeoff and landing. And yes, it is nice that we don't have to listen to folks on cellphones loudly share the intimate details of their private lives for long flights due to a federal law rather than airline policy. I get it - you need to make money and I support your efforts to do this by choosing you each year as my primary provider. But truly, if airlines demanded changes in how passengers are treated at the security checkpoints, or of they pressured airports to privatize screenings as has been done in Orange County, I believe we could be both safer and less molested. It is not in my control to change the TSA, but it IS in my control to not fly. So today, I thought I would share how much money you did not make off of my flight to Dallas this coming week: $731. That' right. I am driving to Dallas and back to avoid being molested by the TSA again. And you know what? I feel much less anxious about this trip than my last one where I could not avoid flying. I will continue to share how much I do not spend this year as it progresses so that there is documentation of the loss of business from just one of your clients because of this issue. I have spoken with multiple frequent fliers and they share my frustration. Indeed, you may not be aware that you are losing business, but I am confident that others are also choosing to drive rather than go through the airport theater. Don't worry. A few times a year I must go so far that a flight is unavoidable and when this is true, I will use you when I can. 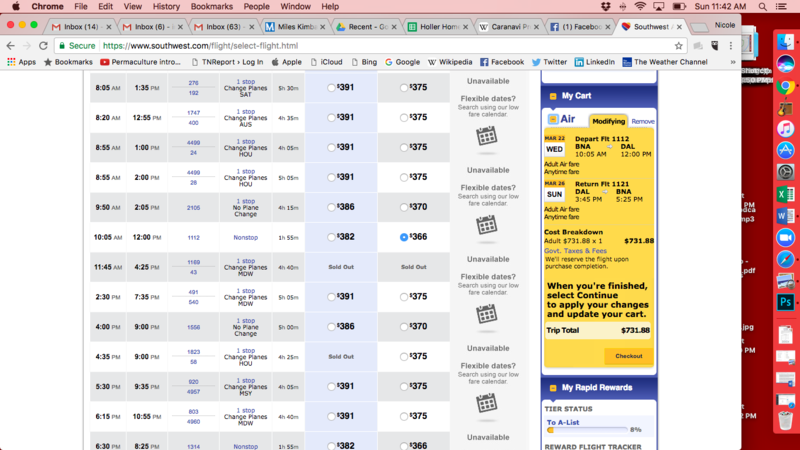 But for now, I just wanted to pass along that I did not spend $731 on a ticket to ride the friendly skies with you.